The three general categories of modern UPS systems are on-line, line-interactive and standby. An on-line UPS uses a "double conversion" method of accepting AC input, rectifying to DC for passing through therechargeable battery (or battery strings), then inverting back to 120 V/230 V AC for powering the protected equipment. A line-interactive UPS maintains the inverter in line and redirects the battery's DC current path from the normal charging mode to supplying current when power is lost. In a standby ("off-line") system the load is powered directly by the input power and the backup power circuitry is only invoked when the utility power fails. Most UPS below 1 kVA are of the line-interactive or standby variety which are usually less expensive. For large power units, Dynamic Uninterruptible Power Supplies (DUPS) are sometimes used. A synchronous motor/alternator is connected on the mains via a choke. Energy is stored in a flywheel. When the mains power fails, an eddy-current regulation maintains the power on the load as long as the flywheel's energy is not exhausted. DUPS are sometimes combined or integrated with a diesel generator that is turned on after a brief delay, forming a diesel rotary uninterruptible power supply (DRUPS). In an online UPS, the batteries are always connected to the inverter, so that no power transfer switches are necessary. When power loss occurs, the rectifier simply drops out of the circuit and the batteries keep the power steady and unchanged. When power is restored, the rectifier resumes carrying most of the load and begins charging the batteries, though the charging current may be limited to prevent the high-power rectifier from overheating the batteries and boiling off the electrolyte. The main advantage of an on-line UPS is its ability to provide an "electrical firewall" between the incoming utility power and sensitive electronic equipment. The online UPS is ideal for environments where electrical isolation is necessary or for equipment that is very sensitive to power fluctuations. Although it was at one time reserved for very large installations of 10 kW or more, advances in technology have now permitted it to be available as a common consumer device, supplying 500 W or less. The initial cost of the online UPS may be higher, but its total cost of ownership is generally lower due to longer battery life. The online UPS may be necessary when the power environment is "noisy", when utility power sags, outages and other anomalies are frequent, when protection of sensitive IT equipment loads is required, or when operation from an extended-run backup generator is necessary. These hybrid Rotary UPS designs do not have official designations, although one name used by UTL is "double conversion on demand". This style of UPS is targeted towards high-efficiency applications while still maintaining the features and protection level offered by double conversion. A hybrid (double conversion on demand) UPS operates as an off-line/standby UPS when power conditions are within a certain preset window. This allows the UPS to achieve very high efficiency ratings. When the power conditions fluctuate outside of the predefined windows, the UPS switches to online/double-conversion operation. In double-conversion mode the UPS can adjust for voltage variations without having to use battery power, can filter out line noise and control frequency. Examples of this hybrid/double conversion on demand UPS design are the HP R8000, HP R12000, HP RP12000/3 and the Eaton BladeUPS. Ferro-resonant units operate in the same way as a standby UPS unit; however, they are online with the exception that a ferro-resonant transformer is used to filter the output. This transformer is designed to hold energy long enough to cover the time between switching from line power to battery power and effectively eliminates the transfer time. Many ferro-resonant UPSs are 82–88% efficient (AC/DC-AC) and offer excellent isolation. The transformer has three windings, one for ordinary mains power, the second for rectified battery power, and the third for output AC power to the load. A UPS designed for powering DC equipment is very similar to an online UPS, except that it does not need an output inverter. Also, if the UPS's battery voltage is matched with the voltage the device needs, the device's power supply will not be needed either. Since one or more power conversion steps are eliminated, this increases efficiency and run time. 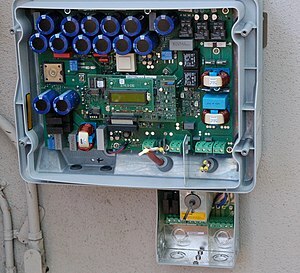 Many systems used in telecommunications use an extra-low voltage "common battery" 48 V DC power, because it has less restrictive safety regulations, such as being installed in conduit and junction boxes. DC has typically been the dominant power source for telecommunications, and AC has typically been the dominant source for computers and servers. There has been much experimentation with 48 V DC power for computer servers, in the hope of reducing the likelihood of failure and the cost of equipment. However, to supply the same amount of power, the current would be higher than an equivalent 115 V or 230 V circuit; greater current requires larger conductors, or more energy lost as heat. A laptop computer is a classic example of a PC with a DC UPS built in. High voltage DC (380 V) is finding use in some data center applications, and allows for small power conductors, but is subject to the more complex electrical code rules for safe containment of high voltages. A rotary UPS uses the inertia of a high-mass spinning flywheel (flywheel energy storage) to provide short-term ride-through in the event of power loss. The flywheel also acts as a buffer against power spikes and sags, since such short-term power events are not able to appreciably affect the rotational speed of the high-mass flywheel. It is also one of the oldest designs, predating vacuum tubes and integrated circuits. It can be considered to be on line since it spins continuously under normal conditions. However, unlike a battery-based UPS, flywheel-based UPS systems typically provide 10 to 20 seconds of protection before the flywheel has slowed and power output stops. It is traditionally used in conjunction with standby diesel generators, providing backup power only for the brief period of time the engine needs to start running and stabilize its output. The rotary UPS is generally reserved for applications needing more than 10,000 W of protection, to justify the expense and benefit from the advantages rotary UPS systems bring. A larger flywheel or multiple flywheels operating in parallel will increase the reserve running time or capacity. Because the flywheels are a mechanical power source, it is not necessary to use an electric motor or generator as an intermediary between it and a diesel engine designed to provide emergency power. By using a transmission gearbox, the rotational inertia of the flywheel can be used to directly start up a diesel engine, and once running, the diesel engine can be used to directly spin the flywheel. Multiple flywheels can likewise be connected in parallel through mechanical countershafts, without the need for separate motors and generators for each flywheel. They are normally designed to provide very high current output compared to a purely electronic UPS, and are better able to provide inrush current for inductive loads such as motor startup or compressor loads, as well as medical MRI and cath lab equipment. It is also able to tolerate short-circuit conditions up to 17 times larger than an electronic UPS, permitting one device to blow a fuse and fail while other devices still continue to be powered from the rotary UPS. Its life cycle is usually far greater than a purely electronic UPS, up to 30 years or more. But they do require periodic downtime for mechanical maintenance, such as ball bearing replacement. In larger systems redundancy of the system ensures the availability of processes during this maintenance. Battery-based designs do not require downtime if the batteries can be hot-swapped, which is usually the case for larger units. Newer rotary units use technologies such as magnetic bearings and air-evacuated enclosures to increase standby efficiency and reduce maintenance to very low levels. 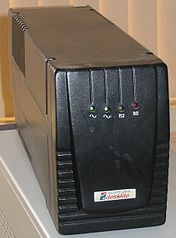 A hybrid rotary UPS, designed similar to an online UPS, except that it uses the flywheel in place of batteries. The rectifier drives a motor to spin the flywheel, while a generator uses the flywheel to power the inverter. In case No. 3 the motor generator can be synchronous/synchronous or induction/synchronous. The motor side of the unit in case Nos. 2 and 3 can be driven directly by an AC power source (typically when in inverter bypass), a 6-step double-conversion motor drive, or a 6-pulse inverter. Case No. 1 uses an integrated flywheel as a short-term energy source instead of batteries to allow time for external, electrically coupled gensets to start and be brought online. Case Nos. 2 and 3 can use batteries or a free-standing electrically coupled flywheel as the short-term energy source. UPS systems come in several different forms and sizes. However, the two most common forms are tower and rack-mount. In large business environments where reliability is of great importance, a single huge UPS can also be a single point of failure that can disrupt many other systems. To provide greater reliability, multiple smaller UPS modules and batteries can be integrated together to provide redundant power protection equivalent to one very large UPS. "N+1" means that if the load can be supplied by N modules, the installation will contain N+1 modules. In this way, failure of one module will not impact system operation. Many computer servers offer the option of redundant power supplies, so that in the event of one power supply failing, one or more other power supplies are able to power the load. This is a critical point – each power supply must be able to power the entire server by itself. Redundancy is further enhanced by plugging each power supply into a different circuit (i.e. to a different circuit breaker). Redundant protection can be extended further yet by connecting each power supply to its own UPS. This provides double protection from both a power supply failure and a UPS failure, so that continued operation is assured. This configuration is also referred to as 1+1 or 2N redundancy. If the budget does not allow for two identical UPS units then it is common practice to plug one power supply into mains power and the other into the UPS. When a UPS system is placed outdoors, it should have some specific features that guarantee that it can tolerate weather without any effects on performance. Factors such as temperature, humidity, rain, and snow among others should be considered by the manufacturer when designing an outdoor UPS system. Operating temperature ranges for outdoor UPS systems could be around −40 °C to +55 °C. Outdoor UPS systems can either be pole, ground (pedestal), or host mounted. Outdoor environment could mean extreme cold, in which case the outdoor UPS system should include a battery heater mat, or extreme heat, in which case the outdoor UPS system should include a fan system or an air conditioning system. A solar inverter, or PV inverter, or solar converter, converts the variable direct current (DC) output of a photovoltaic (PV) solar panel into a utility frequencyalternating current (AC) that can be fed into a commercial electrical grid or used by a local, off-grid electrical network. It is a critical BOS–component in aphotovoltaic system, allowing the use of ordinary AC-powered equipment. Solar inverters have special functions adapted for use with photovoltaic arrays, includingmaximum power point tracking and anti-islanding protection. A problem in the combination of a "double conversion" UPS and a generator is the voltage distortion created by the UPS. The input of a double conversion UPS is essentially a big rectifier. The current drawn by the UPS is non-sinusoidal. This can cause the voltage from the AC mains or a generator to also become non-sinusoidal. 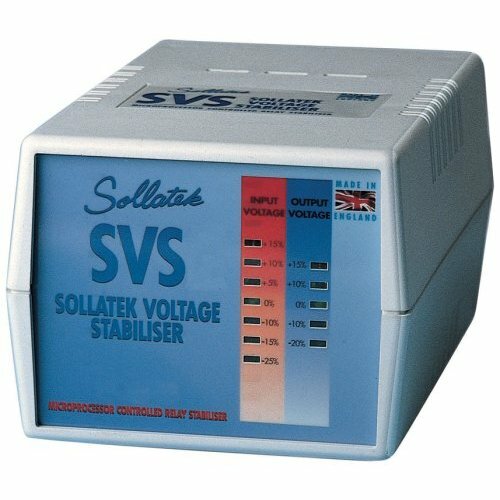 The voltage distortion then can cause problems in all electrical equipment connected to that power source, including the UPS itself. It will also cause more power to be lost in the wiring supplying power to the UPS due to the spikes in current flow. This level of "noise" is measured as a percentage of "Total Harmonic Distortion of the current" (THD(i)). Classic UPS rectifiers have a THD(i) level of around 25–30%. To reduce voltage distortion, this requires heavier mains wiring or generators more than twice as large as the UPS. Classic solutions such as passive filters reduce THD(i) to 5–10% at full load. They are reliable, but big and only work at full load, and present their own problems when used in tandem with generators. An alternative solution is an active filter. Through the use of such a device, THD(i) can drop to 5% over the full power range. The newest technology in double conversion UPS units is a rectifier that doesn't use classic rectifier components (thyristors and diodes) but high frequency components. A double conversion UPS with an IGBT rectifier and inductor can have a THD(i) as small as 2%. This completely eliminates the need to oversize the generator (and transformers), without additional filters, investment cost, losses, or space. A subsystem in the OS that processes the reports and generates notifications, PM events, or commands an ordered shut down. Some UPS manufacturers publish their communication protocols, but other manufacturers (such as APC) use proprietary protocols. The basic computer-to-UPS control methods are intended for one-to-one signaling from a single source to a single target. For example, a single UPS may connect to a single computer to provide status information about the UPS, and allow the computer to control the UPS. Similarly, the USB protocol is also intended to connect a single computer to multiple peripheral devices. In some situations it is useful for a single large UPS to be able to communicate with several protected devices. For traditional serial or USB control, a signal replication device may be used, which for example allows one UPS to connect to five computers using serial or USB connections. However, the splitting is typically only one direction from UPS to the devices to provide status information. Return control signals may only be permitted from one of the protected systems to the UPS. As Ethernet has increased in common use since the 1990s, control signals are now commonly sent between a single UPS and multiple computers using standard Ethernet data communication methods such asTCP/IP. The status and control information is typically encrypted so that for example an outside hacker can not gain control of the UPS and command it to shut down. Distribution of UPS status and control data requires that all intermediary devices such as Ethernet switches or serial multiplexers be powered by one or more UPS systems, in order for the UPS alerts to reach the target systems during a power outage. To avoid the dependency on Ethernet infrastructure, the UPSs can be connected directly to main control server by using GSM/GPRS channel also. The SMS or GPRS data packets sent from UPSs trigger software to shutdown the PCs to reduce the load. The run-time for a battery-operated UPS depends on the type and size of batteries and rate of discharge, and the efficiency of the inverter. The total capacity of a lead–acid battery is a function of the rate at which it is discharged, which is described as Peukert's law. When a lead–acid battery is charged or discharged, this initially affects only the reacting chemicals, which are at the interface between the electrodes and the electrolyte. With time, the charge stored in the chemicals at the interface, often called "interface charge", spreads by diffusion of these chemicals throughout the volume of the active material. Due to the interface charge, brief UPS self-test functions lasting only a few seconds may not accurately reflect the true runtime capacity of a UPS, and instead an extendedrecalibration or rundown test that deeply discharges the battery is needed. Other series strings wired in parallel with the degraded string will now discharge through the degraded string until their voltage matches the voltage of the degraded string, potentially overcharging and leading toelectrolyte boiling and outgassing from the remaining good cells in the degraded string. These parallel strings can now never be fully recharged, as the increased voltage will bleed off through the string containing the failed battery.